Seven destinations. One signature brand. 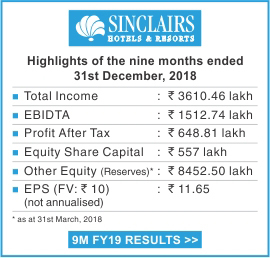 Sinclairs Hotels Limited (SHT:IN) owns and operates hotels and resorts at Burdwan, Darjeeling, Dooars, Kalimpong, Siliguri, Ooty and Port Blair. Each property enjoys premier status in its location for guest comfort, service, food and conference facilities. The Company’s 114 room premium business hotel project at Kolkata has received all clearances and work at site in New Town, Rajarhat is slated to commence in October 2018. The location is the hub of healthcare, IT, business and educational institutions and close to HIDCO Convention Centre. The estimated project cost of Rs.75 crore (excluding cost of land, already acquired by the company) would be met by funds available with the company and ongoing cash accruals. No borrowings are envisaged and the company will continue to remain debt free. The project will be eligible for the fiscal and other benefits, including capital subsidy. 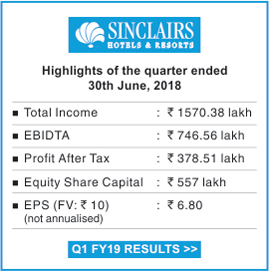 Please visit www.sinclairshotels.com for more details.